Sautéed red onion, sour cream and fresh dill combine to make a delicious, quick pan sauce for boneless chicken breasts and a side of egg noodles or mashed potatoes. Combine the flour, salt and a few grinds of black pepper in a shallow dish and set aside. If your chicken breasts have tenderloins attached, remove them and reserve for another use. Place the breasts between 2 sheets of plastic wrap and gently pound them to a uniform thickness of 1/2-inch. Dredge the chicken breasts in the seasoned flour and shake off the excess. Place a large frying pan over medium-high heat and coat the bottom with about 1/8-inch of vegetable oil. Add the chicken in a single layer and cook until light golden in color, 2 minutes per side. Transfer to a plate and set aside. Add the onion to the pan and add a bit more oil if needed. Reduce the heat to medium and sauté the onion until soft and translucent, 4 to 5 minutes. Whisk the sour cream, chicken broth and vinegar together in a small bowl and add the mixture to the sautéed onion. Cook for 1 minute, then return the chicken to the pan. Continue cooking, turning several times, until the chicken is cooked through and the sauce has thickened slightly, 2 to 4 minutes. Transfer the chicken to a serving platter or individual plates. Add the fresh dill to the sauce, taste and adjust the seasonings as needed. 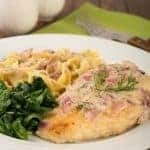 Cook for 1 minute, then spoon some of the sauce over the chicken and transfer the remainder to a small bowl to pass at the table for spooning over buttered noodles or mashed potatoes.